The economic diversification will proceed only slowly, leaving the economy largely dependent on oil revenues and state support for the time being. In June 2017 King Salman appointed his son, Prince Mohammed bin Salman, as heir to the throne, replacing Crown Prince Mohammed bin Nayef. Mohamed bin Salman is the main driver of an ambitious reform program (Saudi Vision 2030) to diversify the economy away from oil and to boost the private sector. This step is important, as the oil sector is not generating enough jobs to absorb population and workforce growth, which could lead to rising dissatisfaction and social tensions. A large anti-corruption purge end of 2017 resulted in the (temporary) arrest of public officials, businesspersons and even some princes, freezing their accounts. However, reforms towards more political rights and participation remain largely off the agenda. The on-going political turmoil in the Middle East is a challenge for the Saudi rulers, with major security problems due to the current situation in neighbouring Iraq and Yemen. Saudi Arabia feels increasingly challenged by growing Iranian influence, its traditional rival for hegemony in the Gulf region. Therefore, Saudi foreign policy has turned to become more assertive, mainly in order to counter Iranian influence, e.g. by supporting opposition (Sunni) forces in Syria and, since March 2015, by a direct military intervention in Yemen against the Houthi rebels, who as a Shia tribe are allegedly backed by Iran. Together with the UAE Saudi Arabia is the driving force of the regional boycott of Qatar, including diplomatic and economic sanctions. This has been a reaction to the country’s close ties with Iran and the Muslim Brotherhood and its suspicions that Qatar is supporting terrorism. 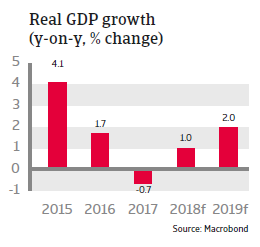 Real GDP contracted by 0.7% in 2017, mainly due to oil production cuts agreed within OPEC, but a rebound in oil prices and the easing of fiscal consolidation will lift economic growth to 1.0% in 2018 and 2.0% in 2019. Ongoing large investments in infrastructure projects such as the Riyadh metro and the USD 500 billion NEOM project (a new city and economic zone) will additionally support economic activity. The Saudi Arabian central bank continues to closely track the monetary tightening steps of the US Federal Reserve in order to support the peg of the riyal to the USD, which keeps liquidity conditions in the banking sector rather tight. As a result, private sector credit growth was slightly negative at the end of 2017. 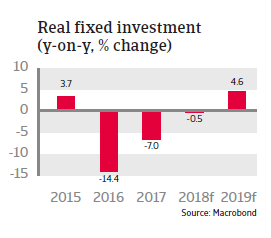 However, the liquidity situation has improved since then due to higher oil revenues, and the banking sector remains sound and well capitalised, with a low level of non-performing loans. 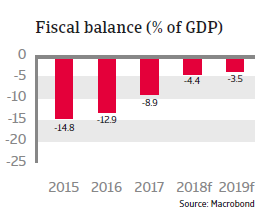 Austerity measures (including petrol price increases and comprehensive subsidy cuts) helped to reduce the budget deficit from 12.9% of GDP in 2016 to 8.9% of GDP in 2017. Going forward fiscal adjustment will be more gradual, as the focus has shifted to support short-term growth. Previously cut allowances for civil servants have been restored, capital spending for projects will be resumed and social transfers to compensate poor households will increase again (in order to avoid any public discontent). Therefore, the target to achieve a balanced budget has been pushed back, from 2020 to 2023, which is no issue due to ample financial buffers. 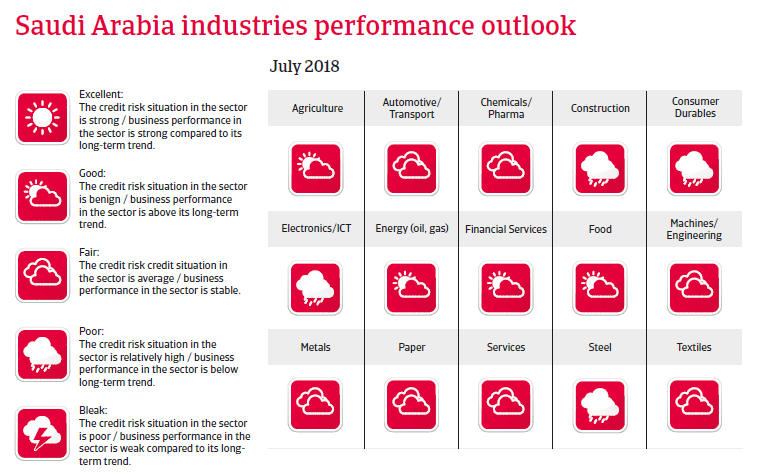 Moreover, government finances are now on firmer footing, as new non-oil revenue sources have been tapped, including higher fuel prices, increased expat levies and the introduction of a 5% VAT tax since January 1st 2018. Public debt continues to increase, albeit from a low base, to around 35% of GDP in 2018, as the government continues to issue bonds to finance the deficit and to protect its reserves. 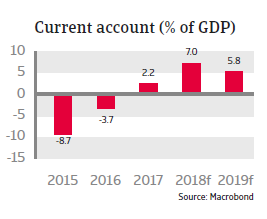 After two years of high deficits the current account has returned to a surplus in 2017 on the back of higher oil prices and is expected to remain in surplus in the coming years. With about 30 months of import cover, international reserves are more than sufficient to defend the currency peg to the USD. Access to international capital markets remains easy, and there is still the plan to transform the Public Investment Fund into a USD 2 trillion Sovereign Wealth Fund (SWF) in order to increase investments abroad. The SWF will be partly financed by the sale of a 5% stake in the state oil company Aramco. A comprehensive diversification of the economy away from oil dependency is high on the political agenda. In 2016 the government announced far-reaching reform goals in its “Saudi Vision 2030” plan. The aim is to transform the economy over the next 15 years by diversifying growth, reducing the dependence on oil, assuring the long-term sustainability of public finances, increasing the role of the private sector and creating more jobs. However, it remains to be seen if the political willingness to implement those far-reaching economic reforms will persist. In any case it is expected that diversification will proceed only slowly, leaving the economy largely dependent on oil revenues and state support for the time being. Although the gradual implementation of “Saudi Vision 2030” should be the driving force of medium-term growth of the non-oil economy, many obstacles remain. 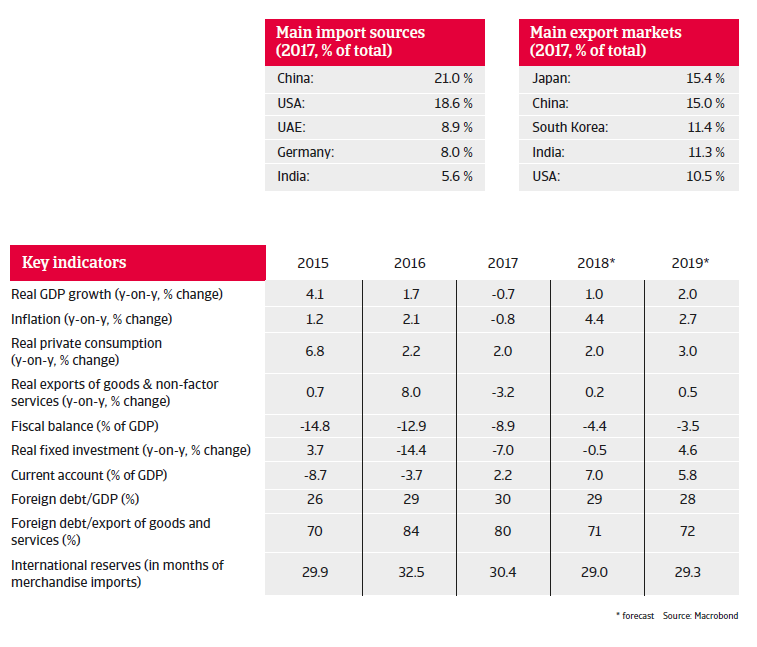 For instance, plans to increase the consumption share of locally produced goods to 50% by 2020 could prove difficult due to an overvalued currency pegged to the USD and without appropriate economic policies to foster external competitiveness. The Saudization scheme to replace cheaper foreign workers with Saudi nationals is hampered by rigid labour laws and skill mismatches. Currently Saudi nationals occupy 90% of jobs in the public sector, but only 19% in the private sector.